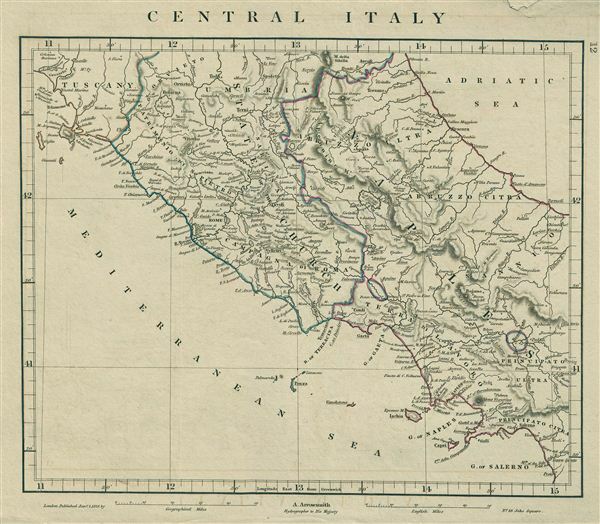 This is a rare example of Aaron Arrowsmith's 1828 map of Central Italy. The map covers the central part of the Italy which includes parts of Tuscany, State of the Church and the Kingdom of Naples. The regional boundaries are colored and relief shown by hachures. During this time in history, revolutionary sentiments favoring the unification of Italy were gaining popularity paving the way to the creation of a single nation. This map was published by A. Arrowsmith, hydrographer to His Majesty, in 1828. Very good. Original platemark visible. Blank on verso. Minor verso repair on top margin.